It has been a few months since I ran this race but wanted to write this report since I was so impressed with the course. 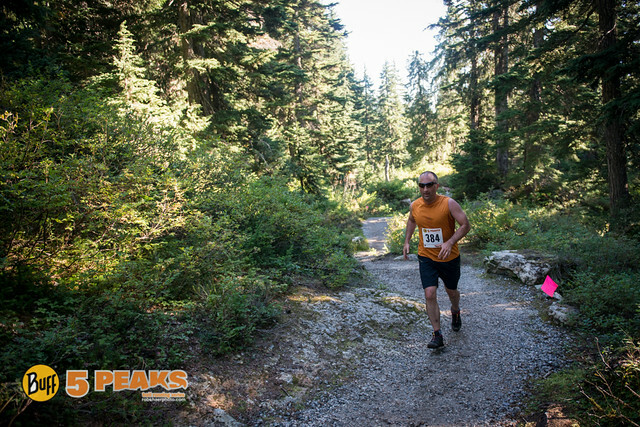 First, 5 Peaks Trail Running Series is called “5” peaks because it literally does 5 peaks or races per season. This year they did 6 by adding Seymour as a last minute thing. Not sure if they need to change the name or not but I am glad they added Seymour back into the season itinerary as it is an awesome run. It has a good mix of up and downhill, single track and room for passing and some nice technical but not too technical to run. Nice work to you both! Awesome to run an event with you both. On the way in I paced myself with the person in front of me. I was worried I was crowding her but didn’t want to pass because she set such a good pace. For the last few KMs I ran behind her. As we came out of the forest trail and onto the last 100 metres I came up beside her. I could see her slow down to let me pass and as I began to make ground she said, “nice race.” I wasn’t competing with her but instead my own time from last year so I looked at her and said, “let’s bring it in!” We both smiled and she kicked it into high gear. We both crossed the finish line going full out. With satisfaction we gave each other a high five and smiled. That’s how you finish a race. Trail runners rock. The actual course is amazing. I prefer it over Cypress or even Whistler. I think the only improvement would be to make it a bit longer so the experience lasts longer. Mind you, this course is not for everyone. Some will find it very technical. Well, it is but it isn’t a crazy technical that is simply unsafe. It is very technical in places but I never felt unsafe as I do on some other runs. If some scrambling doesn’t freak you out and you like to go fast on the downhill, you will enjoy this course. 5 Peaks threw this bonus race in at the last moment and I have to give them credit for communicating it. I not only knew about it right away but also knew all the details. Impressive and way better than communications last year. While I wasn’t as impressed at Cypress as there seemed to be less volunteers and route flagging, this race was excellent and very well organized (especially for a last minute thing). This was amazingly well done considering it must have been rushed. Parking, bathrooms, registration and everything else went off without any noticeable hitches. Food and drink is okay but to be totally honest I now skip the official 5 Peaks food and drink tables and go straight to the MEC chocolate milk and then the Cliff bar tent for a couple Cliff bars. Don’t get me wrong, it is fine but the chocolate milk is amazing at MEC. Aid stations are crucial but often overlooked. The Ski Patrol that volunteer to help with first aid are first class. Not only do they put up with us whining racers with our aches and pains but they enthusiastically encourage us throughout the race. Awesome people. Some races don’t have enough volunteers but this one seemed to have a decent amount and they were awesome. Need I say more? Oh ya.. THANK YOU!!! Easy to find location and ample free parking. No issues at all. Well marked, well documented and very easy. Registration was literally 100 yards away from the car. Signup is easy on line. No more race day registration which may sound bad but it ensures no mix ups as I experienced last year. I think this was a good decision by this years race organizers. Thanks for sorting this out! During registration you are also offered the opportunity to donate to certain causes which is cool. One suggestion might be to have an option to buy a race tshirt. 5 Peaks has one of the best set of race partners with MEC, Solomon, Cliff Bar and Suunto present with race tents. Buff is now a sponsor as well this year which is cool as the have interesting products. You can demo some excellent Solomon shoes or at least try them on and ask questions. MEC offers chocolate milk after the race which is also super popular. Thanks to Cliff Bar for the great snacks too. How about the vendors offering some products to buy from the tents? So my total score for the 2014 Seymour 5 Peaks is an impressive: 86.5 out of 100 ! I highly recommend this race to trail runners who like a technical race you can let go of the reins on. I really enjoyed this track and I think you will too.